I LOVE a good Reuben Sandwich…… don’t you? 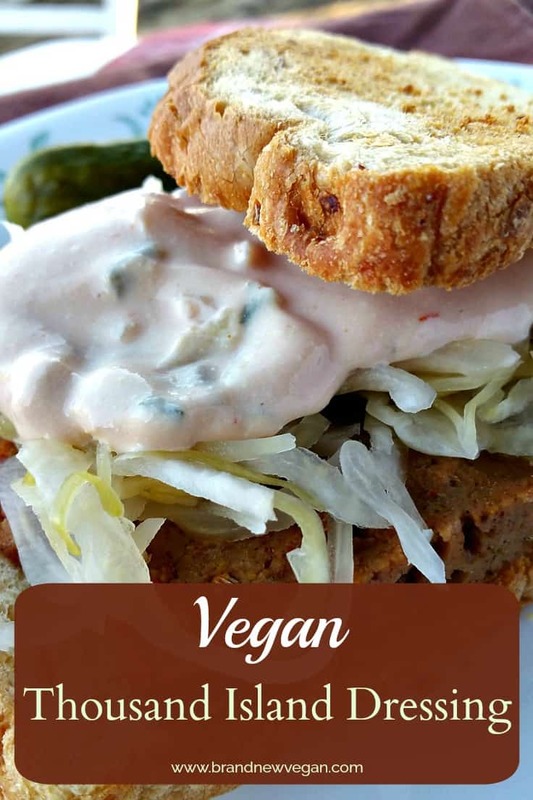 And once you find a good Vegan Corned Beef Recipe (which I did, thanks Vegan Dad), all you need is some fresh Sauerkraut, and this homemade, Vegan Thousand Island Dressing. I’ve been on a probiotic kick lately, so I picked up a jar of real Sauerkraut made from a San Fransisco Company called Bubbies. And I mean REAL Sauerkraut – not that canned stuff you see in the store. You see REAL Sauerkraut is full of healthy probiotic cultures – kind of like Yogurt – that are super important for building the good kind of microbiotic bugs that live in our gut. During digestion, these gut bacteria (which number in the trillions) perform all kinds of functions – like make vitamins , send signals to the immune system, and even help your brain work. The wrong kind can also make you sick – so it’s imperative you are feeding these little guys the right stuff to encourage the beneficial ones to grow. Naturally fermented foods – like Sauerkraut is one way of doing just that. 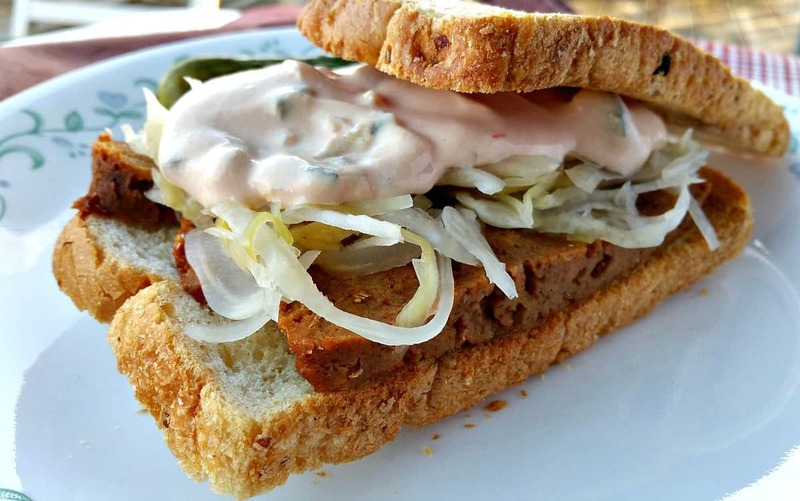 Since the Corned Beef part of this sandwich is NOT my recipe, I’ll post a link here to Vegan Dad’s Reuben Sandwiches. Vegan Dad has been around for quite a while so even though I tweaked his recipe a bit – he deserves the credit. One thing I will say – ELIMINATE THE SALT – maybe even some of the Seasoned Salt as well. Trust me …. the Kraut is going to be salty enough – no need to add any more. Other than that – it was really good. I did add some additional Fennel Seeds for flavor, and I cut back on the Cloves (I hate cloves) but otherwise I followed the recipe exactly. The flavor was really good, and the texture was awesome. So good job Vegan Dad! Ah – here’s where I come in. 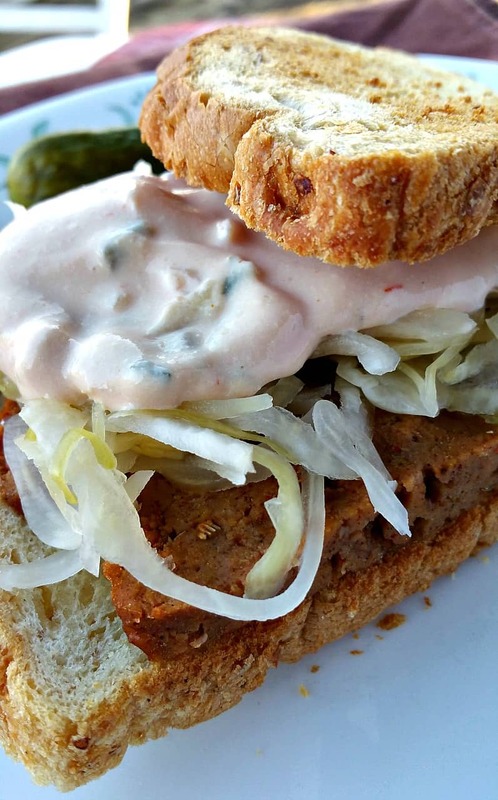 I needed a Thousand Island Dressing for these sandwiches and since store-bought dressing is based on Mayonnaise – I was going to have to make my own. Tofu, Lemon Juice, Vinegar, Ketchup, and some Dill Pickles and you’re set to go. This is a blender recipe too – so cleanup is a breeze. Now I’ve always been a Thousand Island fan. Sure Ranch is ok – occasionally. And I absolutely LOVED Blue Cheese – but we know how unhealthy THAT was, so I usually stuck with my tried and true Thousand Island. 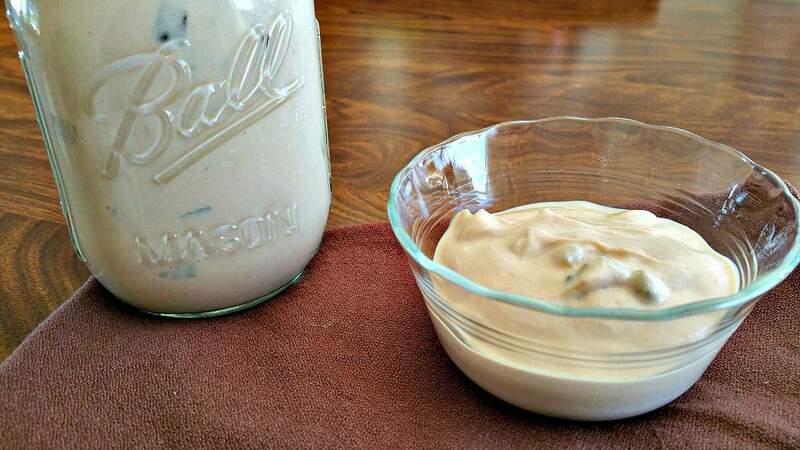 And THIS Vegan Thousand Island Dressing is everything I remember – and more. I hope you enjoy it as much as I do – especially when it’s spread on some Hearty Rye Toast piled high with Vegan Corned Beef and Sauerkraut. 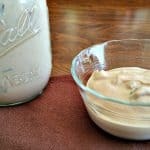 This Vegan Thousand Island Dressing tastes so much like the original, you'll be putting it on everything. Perfect for Salads, as a Dip, or slathered on some Homemade Reubens. Drain Tofu and add to blender. Add all remaining ingredients to blender except for Ketchup and Pickles. Turn out into a small bowl and stir in ketchup and diced pickles. So, you were able to make his recipe with no oil? And what brand of rye bread do you use that has no oil added? Thanks! This sounds delicious!! The only fat in this recipe is what’s in the Tofu. You can bake your own Rye Bread or use Ezekiel. Hi Chuck, don’t see the link to Vegan Dad’s recipe, but I think I found it online. Did you add the oil called for in the recipe? And how did you form the seiten? This dressing is excellent! I made a soy curl reuben since I didn’t have any seitan on hand and did have the soy curls. Outstanding, husband couldn’t stop raving about how good it was. This dressing made the sandwich. Can’t wait to try it on a salad. Thanks, Chuck! whatcha did to the soy curls to make a reuben? How do you make your recipe box above? I havent been able to figure this out yet. Are you familiar with Kraft Sandwich Spread? It is kind of a thicker thousand Island Dressing but from the ingredients it has Turmeric in it. If you have a recipe for this, that would be great. Do you think that the dressing will freeze well? Sounds tasty! I love reuben’s, so I’ll make this dressing next time! Never would have thought to make a salad dressing using tofu. What a great way to add even more protein to a salad or sandwich! This looks delish!! How many days do you think it will last in the fridge? 5-7 hopefully. can you make this with out tofu or what can I sub for tofu? I’m making this today. Does the firm tofu and the silken give different results? I currently have firm in the house and was debating on buying silken just for this. I’m so excited to try it. I can’t wait. I’ve always used firm and always had good results, but I bet silken would be even smoother..